.... He is at his most exotic when exploring the mysteries of a summer evening in a small midwestern town. Streetlights blink on, fireflies flicker over the yard, cicadas and crickets chirp in the warm air. As you walk down the sidewalk, you can hear the clatter of dishes through open kitchen windows, the creak of swings and rocking chairs and the murmur of the men sitting in the yellow dome of light on the front porches, a whiff of tobacco smoke hovering overhead. Out on the darkening lawn, a cluster of boys led by Douglas Spaulding argues, wrestles, and plots. Tomorrow, they’re going to refight Shiloh all over town, using the parks and cemetery as battlefields. They’ll steal the chess pieces from the old men who play in the town square and magically control the boys with their knights and rooks. Tomorrow night, they’ll break into city hall and kill the clock that keeps the town in thrall. The idyll is touched with melancholy and a tremor of gulping panic. It’s late enough in the summer for the boys to feel the chill of a new school year coming. Pencils and notebooks are displayed already in the shop window at the five-and-dime. Summer is ending, and with it, freedom and innocence. Bradbury’s America feels as vigorous as boyhood, and as elegiac. 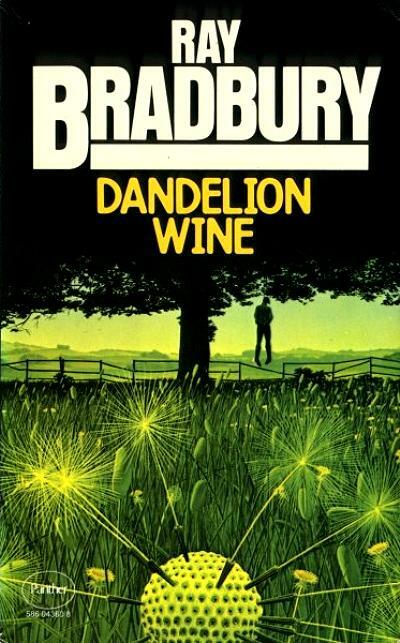 I looked for Dandelion Wine at Amazon only to discover that almost none of Bradbury's books are available for Kindle. 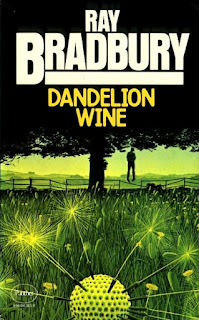 That is an option I would love to have [but Bradbury probably resisted].